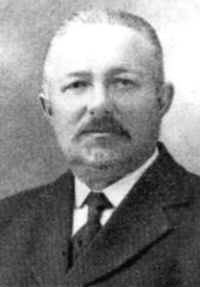 Franz F. Enns, a minister of the Terek Mennonite congregation, was born in Alexandertal, Molotschna, South Russia on 25 October 1871. He was the son of Franz F. and Elisabeth (Franz) Enns. He was baptized in Gnadenfeld in 1891 and married Anna Dürksen of Alexandertal on 27 May 1893. Six children were born to them. One of the two sons was Dr. G. F. Enns of Chilliwack, British Columbia. Franz Enns was one of the pioneers of the newly opened Terek settlement and was elected a minister of the Mennonite congregation there in 1903. In 1906 he was ordained elder. After the flight from the Terek in 1918 he served as elder of the Mennonite church in the Memrik settlement, 1920-1923, and at Suvorovskaya, 1923-1925. He moved back to Memrik (village of Waldeck) in 1925, and immigrated with his family to Canada in 1926, arriving at Winkler, Manitoba in May. In July Franz Enns took over the work of itinerating minister for the Board of Home Missions (General Conference Mennonite Church). He remained in this work until incapacitated by ill health early in 1939. In November 1926 Franz Enns, together with his family and sons-in-law, moved to a farm near Lena, Manitoba. Here he organized the newly settled immigrants as the Whitewater Mennonite Church, of which he was elder until 1938. In 1931, in order to be better able to follow his ministerial duties, he left the farm and moved to a small home in the town of Whitewater, close to daily mail and railroad services. He died in Winnipeg on 2 March 1940. During the years in Canada he did an invaluable work in looking up and serving the immigrants who had settled in scattered groups and families far from organized congregations throughout Manitoba. Enns, F. F. "Enns, Franz F. (1871-1940)." Global Anabaptist Mennonite Encyclopedia Online. 1956. Web. 20 Apr 2019. http://gameo.org/index.php?title=Enns,_Franz_F._(1871-1940)&oldid=91704. Enns, F. F. (1956). Enns, Franz F. (1871-1940). Global Anabaptist Mennonite Encyclopedia Online. Retrieved 20 April 2019, from http://gameo.org/index.php?title=Enns,_Franz_F._(1871-1940)&oldid=91704.